"Eighty percent of people are able to lose weight in their life, but the problem in this country is that nobody can keep it off," Layne Norton, Ph.D., told CBS News. "Of those who did lose weight, 95 percent will gain all the weight back and one-third to half will put on more weight than before they started to diet." Norton completed his Ph.D. in nutritional sciences and is also a bodybuilder and coach. Norton says fad diets are a big part of the reason most people can't keep weight off. Everyone wants a quick fix rather than a sustainable lifestyle change. "The amount of times you try to lose weight in your life is directly proportional to the amount of fat you gain in your life. If you can't see yourself doing the diet you're doing now in 18 months, you're going to fail," Norton said. One approach that's becoming increasingly popular is called flexible dieting, also known as IIFYM (short for "If it fits your macros"). Flexible dieting has taken off over the past few years and won enthusiastic support among bodybuilders, power lifters, CrossFitters and others aiming to look and feel their best without feeling deprived. Flexible dieters have a personalized target of calories, macronutrients (protein, fat, carbohydrate), and fiber to hit every day. Each person's individual target numbers are calculated to take into account their goals and activity level. Food selection is up to you as long as these numbers are met. Enthusiasts like that there are no "good" or "bad" foods; there's room to indulge in treats as long as you meet your overall daily targets. "I really try to reinforce with people, quit looking at [food] as 'good' or 'bad' or 'clean' or 'dirty,'" Krissy Mae Cagney, a licensed sports nutritionist and author of the book "FD 2.0: A Flexible Nutrition Philosophy for the Modern Athlete," told CBS News. "Look at an egg and know an egg is protein and fat. Look at an Oreo and know an Oreo is carbs and fat. A lot of people think carbs and fat means 'bad.' It's not always the case because an apple with peanut butter on it is carbs and fat," she said. "Obviously some foods have more micronutrients in them than others, but that's what you really need to look at. 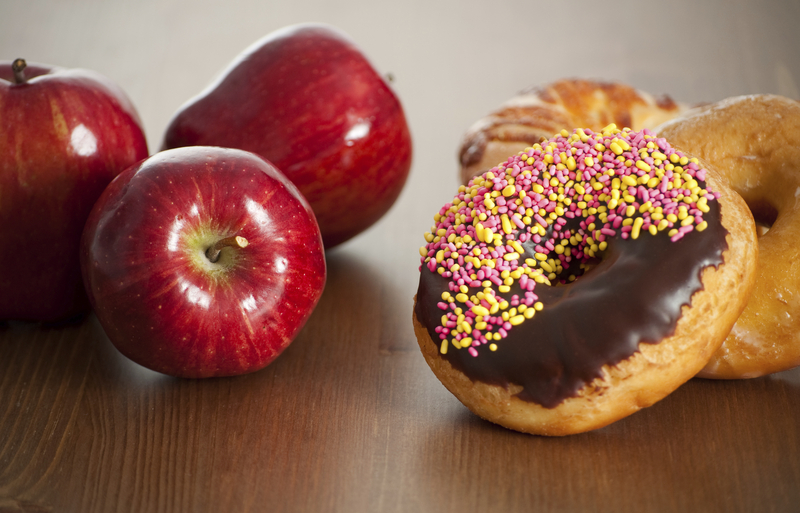 So, if I've eaten really well all day and I hit all my micronutrients, I'm OK with having the doughnut." Cagney recently launched the fitness clothing brand Doughnuts & Deadlifts to help spread the philosophy that "moderated indulgence isn't incompatible with health, fitness, and strength." So, how do you figure out your macronutrient goals? The official IIFYM website has a calculator that is accurate if used correctly, Norton said. It configures your macronutrients based on your age, height, weight, body fat percentage, weekly activity level and other variables. For example, for a 35-year-old woman who's 5 foot 4, 130 pounds, moderately active and works out for an hour at a time 3 days a week, the online calculator recommends a daily target of 104 grams of protein, 256 grams of carbs, 52 grams of fat, 26-33 grams of fiber, and a total of about 1,900 calories to maintain her current weight. The targets would differ if her goal was to lose weight or to build more muscle. "Your food has to come from three sources: carbohydrates, proteins and fat. Those are the only sources that provide calories," explains registered dietician Jim White, a spokesperson for the Academy of Nutrition and Dietetics. "So if you go on a low-carbohydrate diet, the rest has to come from protein and fat." "An athlete would need more carbohydrates than a non-athlete, so their ratio might be 60 percent carbohydrates, something like 20 percent protein, 20 percent fat," White said, while someone who exercises less might be better off with 40 percent carbs, 40 percent protein, 20 percent fat. "People almost always put in their best case scenario: their lowest weight, the highest level of activity. That results in higher macros and ultimately a calorie surplus, so I always tell my clients to be as accurate as possible," Norton said. He is currently working on an IIFYM calculator of his own that will launch within the year. Cagney says when she assigns macros for her clients, the most essential calculation comes down to calories in and calories out. "Then depending on if you have weight loss goals, weight gain goals, athletic performance goals or health goals, from there, you can determine if you need to be on a deficit or a surplus," she said. "Many people get the wrong impression that IIFYM'ers only eat Pop-Tarts and ice cream because of meals posted on social media. That simply isn't true," Norton said. "People don't want to see pictures of chicken and broccoli, so the perception of flexible dieting becomes convoluted: doughnuts, pizza and ice cream." In reality, it's all about budgeting and spending your daily allotment of macros where the individual thinks is worthwhile, Norton said. For example, let's say a person has 150 grams of carbohydrates allotted per day. Eating one package of Pop-Tarts will knock out roughly 80 grams. It would not be the best choice to use half of the daily carbohydrate intake on sugar-filled, low-fiber Pop-Tarts, when more nutrient-dense carbohydrates like brown rice, sweet potato and oats provide greater satiety. But bodybuilding and flexible dieting coach Brittany Dawn said it would be wrong to think of all "treat" foods are inherently bad. "We've all been taught carbs are bad after 5:00 p.m. or my favorite, fat makes you fat. We get excited to post pictures of these foods on social media. People think it's too good to be true to eat Oreos and still hit your goals," Dawn said. "I fill my diet with a lot of fruit, a lot of vegetables, whole grains. Once I hit those numbers is when I can start to have more of the fun foods I want with whatever carbohydrates and fats are left in my diet," she told CBS News. "I love my Oreos, and I still wake up lighter on the scale." Flexible dieting started with the bodybuilding community, which might leave the impression that it's about achieving a certain physique rather than enhancing overall health. But Cagney says it flexible dieting provides the structure for making healthy food choices. "My rules for me are always hit my calories, always hit my protein, always hit my micros, and where I'm flexible with myself is with carbs and fats," Cagney said. Norton prefers this approach to one used many coaches who emphasize a "clean" food diet while allowing a weekly "cheat" meal, or sometimes a whole cheat day, which he says can actually lead to bingeing. "A doughnut is not the same as rice, but if you get the same macronutrient breakdown at the end of the day, the metabolism and cells see the same thing," he said. As Cagney explains in her book: "A diet of pizza is different than a diet that includes pizza. Looking at a single food a person consumes isn't the same as looking at all the foods a person consumes. You can eat 'unhealthy' foods and still have a 'good' diet. That is one of the central tenets of flexible dieting." A diet that lets you enjoy the occasional doughnut may seem too good to be true, but it's not a license to eat whatever you want. Enthusiasts say this approach can work for anyone who's willing to make the effort. "It is not necessary to carry a food scale with you, especially if you prepare your meals beforehand," certified personal trainer Michael Spearman said. "You can eye an amount of food once you get used to tracking your macros, but if you want to be accurate with reaching your macro numbers, you don't want any room for failure." If doing the math yourself seems overwhelming, a registered dietitian can help. "Unless they're a bodybuilder or an athlete -- a lot of people will learn how to do this, but for the general population, calculating this? No," says Jim White. "I definitely recommend a person see a dietitian to get these macronutrients in the appropriate way and get a meal plan." "I have never met someone severely overweight that did not suffer from some sort of addiction. There's always a food addiction, sugar addiction, overeating or eating feelings," Conrad said. "Giving them the option to incorporate foods that trigger that addiction will not help, but only further trigger the addiction." "At some point, you need to consume foods in moderation. That is a healthy relationship with food," he said. "When I hear someone say, 'If I have sugar, I just can't stop,' well, that's binge eating, and it is usually triggered by stress. Those same individuals have a hard time with a rigid meal plan, too. Tracking may not be appropriate right now for that person." One point Norton, Conrad and Cagney all agreed on is the benefit of moving away from the word "diet" and avoiding weight loss fads. "Slow progress is the best progress. Flexible dieting and nutrition is a philosophy that has longevity," Cagney said. "It's something you can do for life."